NEW YORK (CNNMoney) -- Verizon Wireless has joined competitors AT&T and T-Mobile in eliminating the option for customers to consume unlimited data on their mobile phones without paying additional fees. The company announced plans to move ahead with its usage-based data plans in June, but specific details regarding the plans were first confirmed by FierceWireless on Tuesday. Beginning Juy 7, Verizon smartphone customers will be able to choose from $30 for 2 gigabytes, $50 for 5 gigabytes or $80 for 10 gigabytes, with a $10-per-gigabyte overage charge. 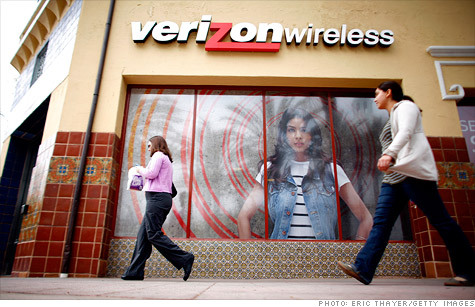 To date, Verizon (VZ, Fortune 500) has offered an unlimited data plan for $30 a month. Under the new system, existing Verizon customers will be able to keep their unlimited data plan, even if they upgrade their phones on or after July 7. Verizon is one of the last major carriers to ditch the unlimited model. Sprint (S, Fortune 500) is now the the only major U.S. carrier to offer an unlimited smartphone data plan. In June 2010, AT&T became the first carrier to relinquish its unlimited data plan. AT&T (T, Fortune 500) customers now pay $15 a month for 200 megabytes of data, or $25 for 2 gigabytes plus an additional $10 per gigabyte that exceeds the allotted 2 GB limit. In April, T-Mobile also canceled its unlimited data plan. T-Mobile now offers plans starting at $10 a month for 200MB of high speed data. Customers who go over their plan's data limits can either upgrade to a more expansive plan or continue using their current plan with sharply reduced data speeds until their next billing cycle. The announcement came as no surprise to Verizon customers. In January, the company announced the long awaited Verizon iPhone, but said they'd allow unlimited data "for a limited time."